Collectif 212: a quick and illustrative overview on an original initiative, which brings together, for the first time in Morocco, the projects of seven artists of multiple and heterogeneous forms of expression. Photographs, installations, work on canvas, videos and other plastic propositions, thusly reunited, they invite us to meet those universes that both challenge and answer each other. The exhibition 30 x 30 of the Collectif 212 consists of seven artworks, representative of the personal work of the authors and constituting a whole, assembled with a common constraint: the size of 30 x 30 centimeters. Safaa Erruas, Jamila Lamrani, Hassan Echair, Amina Benbouchta, Imad Mansour, Myriam Mihindou et Younès Rahmoun, each one of these artists has interpreted this constraint according to the contemporary stakes that animate their own artistic approach. Gaza, the artwork of Safaa Erruas, is a frail structure constituted of gauze and metallic wires. Lightness and minimalism characterize the whole, emitting an insidious force on the theme of wounds, of the tension between the softness of the white color and the sharp solidity of the metal. The work of Younes Rahmoun is a cube made of cardboard presented on the floor, inside which, a small craft evolves towards the light, symbol of the return towards the self. 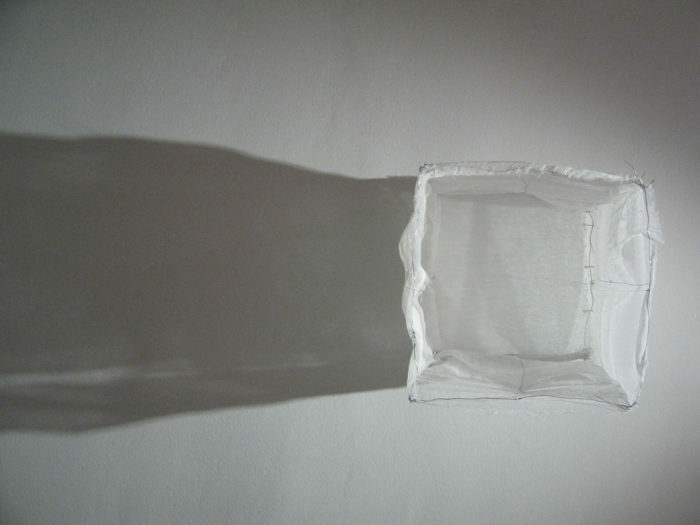 In fact, the tension resides between the material world, represented by the content of the box, and the immaterial world referred to with the light. The artwork of Imad Mansour is of another register, a more playful one: his box is closed, and only an eyecup allows access to the painting that is placed in the bottom. With The Empty Column, Myriam Mihindou explores the notions of space and body, caught up in a ritual of mourning and disappearance… This video displays an affecting personal journey, which can be of concern to us all. The work of Hassan Echair, painting/sculpture takes up the themes of weight and gravity, both concepts that are held dear by the artist. The artwork is made of a rock tied to the same canvas. Jamila Lamrani has built a cube from filaments of glue, a very ambiguous work where, behind the woven spider web, pearls are revealed. A performance by the dancer, Christine Quoiraud, will be presented on the night of the opening; and in every month of this season, one artist of the Collectif 212 will be featured until June 2006.